.......53 Buddhas and Me .................My Life Adventures.....: "Tassie Pressos"
Hi all, yes I am back. I cannot believe I haven't looked at my emails, blog etc. since Wednesday. I thought I would have withdrawals, but I coped just fine. I am very pleased to say that both of my sailings on the ship were very smooth and enjoyable. The weather was pretty good, but it could have also had something to do with the lovely little pills I got from the chemist. 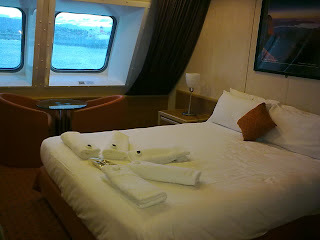 On my sail ing from Devonport back to Melbourne I was lucky enough to get a cabin upgrade to a Deluxe cabin. So I went from the cheapest cabin to the best!!. It was situated right at the front of the ship and as we sailed into Port Melbourne at 5.30am this morning the view was amazing. Only problem was, I had left my camera in the car and had to make do with my phone camera. Over the two days we gave presentations to almost 200 "Seniors". The majority were really really nice people, but why do some people just have to be pains. I would hate to live my life where I enjoyed looking for faults or anything to complain about. Hang on I am now do exactly that - look what they have done to me. OK, I take that back - I will just say it takes all kinds to make our world turn. 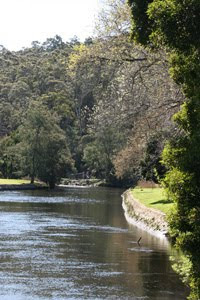 I so enjoy getting down to Tasmania, it is such a beautiful state. For such a small place it is jammed pack with fabulous scenery, wonderful food such as Tasmanian Oysters, Dark Chocolate covered Raspberries - Yummo - Pepper Berry Cheese -all of which I ate way way to much. I am really honoured that I am a descendant of Tasmanians, I am proud to say I am a Victorian born Tasmanian. Hi Davine, It was really interesting to read about your sailings. Deluxe cabin! Looks very impressive. Welcome home. Your photos are fantastic and quite the blessing to be upgraded such as you were! The people who chose to complain, in my opinion, are lost souls. I think that they missed out on a lot in life, they most likely need some time, love, and appreciation. Even the toughest nut can be broken! I find that it can be taxing on the nerves to try to get through to some, yet once a person gets through generally there is a sad, lonely individual inside. I believe that we as human beings all need love and acceptance, it's not only a want... it's a need. I pray for people such as you speak of! Davine, the accommodation looks so luxurious! What a fabulous way to end your successful Tasmanian experience. You always sound happy when you speak of your visits to Tassie.